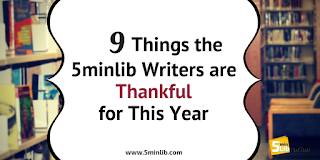 Every year at this time, we here at 5 Minute Librarian like to take a moment to express our gratitude for the wonderful things we have in our lives, both personal and professional. You can read our past years' gratitude here: 2015, 2016, 2017. As always, we are extremely grateful to our readers, without whom we wouldn't have been able to keep writing for so long. It warms our hearts to see people commenting and sharing our articles, so please keep it up! Baby Friendly Libraries - it is interesting being on the opposite side of things, moving from librarian to patron. As a parent to two young kids, there are things I really appreciate. First -- baby friendly places. It really is the little things -- like having changing tables as well as having them in both the women's and men's bathroom. It is so gross trying to change the diaper on the floor! I've also noticed there have been two different ways libraries handle dirty diapers: the "take the dirty diapers with you" and "ask for a bag to contain the smell". I feel so much more welcomed at the latter one, especially since being a frazzled mom, I can't be guaranteed that I'll remember to take that poopy diaper out of my car. Sibling Friendly Library Programs - I know it is hard to plan a program for different ages and my kids are definitely far apart with five years between them. However, we do come as a packaged deal and seeing "Siblings allowed" on a flyer makes a big difference on whether we can come or not. So, thank you to those who accommodate siblings when you can! Fine Free Benefit - Our local library does not charge late fines on their items. That's honestly the main reason we continued to borrow from the library this year. My baby isn't sleeping, hasn't slept well in 8 months, so staying on top of library materials is tough. Even though I can afford the small fines we would build up, I find it frustrating when I keep missing the due dates. Now, every time we miss a due date, I just feel grateful that my library doesn't charge me for it. 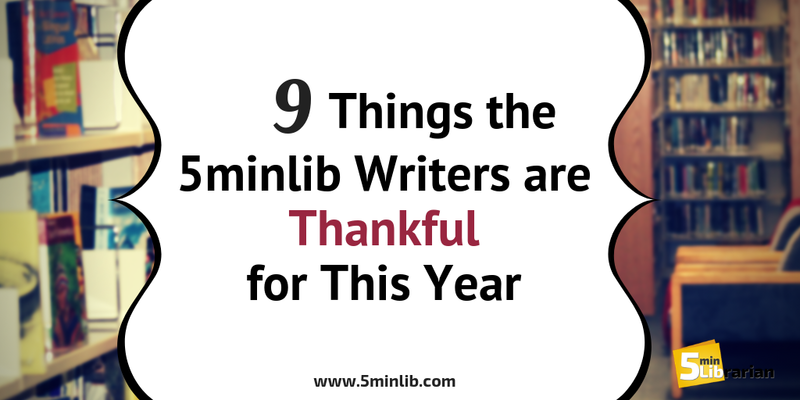 Bonus: Fabulous Co-Bloggers - While not technically library related, I am so very grateful for my co-bloggers. This year has been rough, mostly because I had a baby a year ago and he doesn't sleep well. Hasn't for 8 months straight. There have been many times that just surviving the day was all I could muster. So, lots of love to Kat for stepping in and making sure we continue to post weekly and to Allie, who also has a little one, for being dependable with her monthly posts. This blog wouldn't have survived without you two! My New Job - Just a few short weeks ago, I switched from one job to another. I am not here to badmouth my old position, but to praise my new one; talk about a dream library! The staff are all knowledgeable and friendly, the facility is nice, and I can pretty much come up with any program ideas and be given the enthusiastic go-ahead. The biggest perk this job has is that everyone who works here seems to genuinely want to be at this library: the bulletin boards are beautiful, the lunch room conversation is friendly, and the staff meetings include laughter. I am so incredibly grateful to my new supervisors and coworkers, and the opportunity to work for this fabulous town. Vendors - In my previous position, we had a policy that items could only be purchased from Baker & Taylor, Ingram, and Amazon.com. Now, these are fantastic vendors, but relying solely on these outlets means that a librarian can miss out on all the amazing things from small publishers and lesser-known authors, and some amazing salespeople who know exactly what I'm looking for and can find it! AMAZING! Social Media - I know, it can be overwhelming, but I love social media. In addition to all the wonderful outreach opportunities for work, it gives me a chance to connect with friends and family that live far away, or whose busy lives no longer have time for a weekly chat. I can see photos of my nephews and my friends' children growing up, even when I don't get to see them as often as I'd like, and can share my own excitements (and cat photos) with others. I have made friends with people I may otherwise not have met (especially on Twitter), and it really makes me feel more connected to the world, even when I usually have my nose in a book. Conferences and Symposiums - I attended YALSA's Teen Symposium this year and it was great. I love that librarians are so open and willing to share their ideas. I don't have to constantly reinvent the wheel and I can learn from what others have done. If you have a chance to attend a library conference I highly recommend it. It's great to be with others in your profession who just get it. Letting Go (of Books) - Now that I have a baby, sleep is at a premium, not to mention reading time. It's taken me many years to allow myself to stop reading a book that I'm just not into. It's disappointing when you've been waiting weeks or months to read a certain book and when you finally have the chance... you're no longer in the mood for that kind of book or it's not holding your attention. I used to drag myself through books because I felt I had to. Now, I give it a few pages or chapters and if it's not what I want to read right now I move on. I'll never be able to read all the books I want to, so why should I waste time reading something I don't want? 10 Little Dinosaurs from Little Tiger Press - My baby LOVES this book. It sings 10 little dinosaurs twice and he's always fascinated with it. I highly recommend it. Plus the illustrations are super cute.